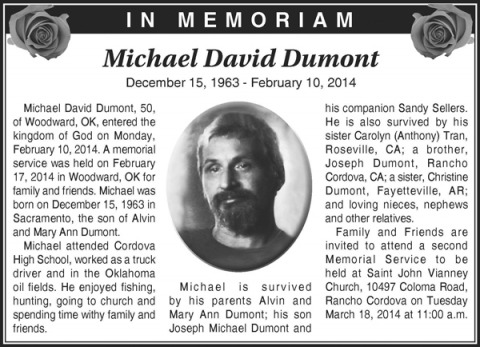 Michael David Dumont, 50, of Woodward, OK, entered the kingdom of God on Monday, February 10, 2014. A memorial service was held on February 17, 2014 in Woodward, OK for family and friends. Michael was born on December 15, 1963 in Sacramento, the son of Alvin and Mary Ann Dumont. Michael attended Cordova High School, worked as a truck driver and in the Oklahoma oil fields. He enjoyed fishing, hunting, going to church and spending time with family and friends. Michael is survived by his parents Alvin and Mary Ann Dumont; his son Joseph Michael Dumont and his companion Sandy Sellers. He is also survived by his sister Carolyn (Anthony) Tran, Roseville, CA; a brother, Joseph Dumont, Rancho Cordova, CA; a sister, Christine Dumont, Fayetteville, AR; and loving nieces, nephews and other relatives. Family and Friends are invited to attend a second Memorial Service to be held at Saint John Vianney Church, 10497 Coloma Road, Rancho Cordova on Tuesday March 18, 2014 at 11:00 a.m.